MMF Steelmaster Slanted Vertical Organizer - Vertical organizer features extra-wide compartments to provide greater capacity for files, reports and documents. Slanting base allows high visibility. Made of heavy-gauge steel with scratch-resistant and chip-resistant finish. 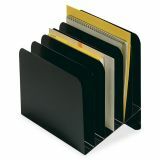 Vertical organizer has nonskid rubber feet. Contains 30 percent post-consumer recycled steel.